I don’t know that student behavior changed, but I do know that in every situation, we have an option about how to respond. When life gets difficult or things don’t go the way that we think that they should, we get to choose how we react. Will we allow the trials and turmoil of today steal the joy and the great day that we can choose to have? What are you currently facing? Are you misaligned with those who supervise you? Are some of your colleagues pulling you down? Are those that you serve draining you? Is your business or life not going the way it should? The good news is that you get to choose what you think about and how you respond to each situation that you are faced with. Life is too short to allow circumstances to steal the joy you can have each and every day! Did you wake up this morning? Are you breathing? Do you have a place to live? Do you have food to eat? Is there someone who loves you? If you can answer yes to any of those questions, then there is something to be joyful about. Don’t lose sight of what is really important. Do you need to find a little joy today? What can you do to make someone else’s day special? Sometimes our joy is not found in satisfying our needs, but going out of our way to better the day for someone else. Remember, you get to choose. 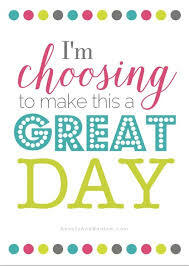 Make it a great day or not…hoping you will choose the best!